As the Lion Road road nears the MBahza Mountains, a ridge cuts across the landscape from west to east. Originally the road detoured, adding a day or more of travel, along the face of the ridge until it could ascend. Years ago, the Dwarves of Sebbek Sobor heard of complaints about the delay from various merchants of their allies in Narumbeki. 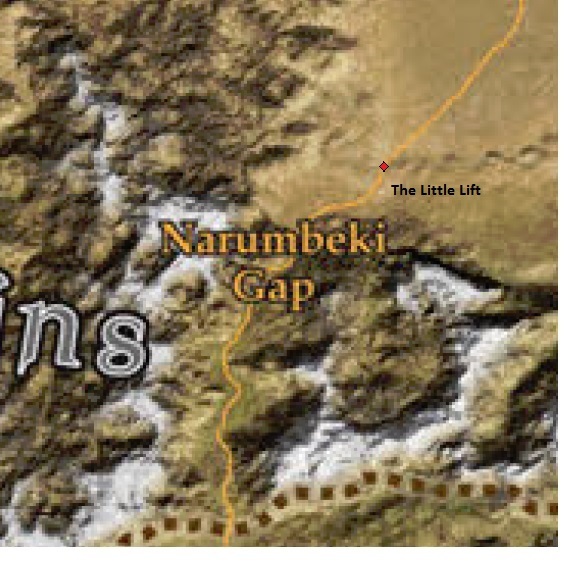 The Dwarves sent a number of engineers (with a goodly train of guards and provisions) north through the Narumbeki Gap. At the ridge, they undertook construction of a mechanical lift to raise wagons up the 100 foot rise. The first lift was small, carrying a single vehicle at a time, but was quite successful. 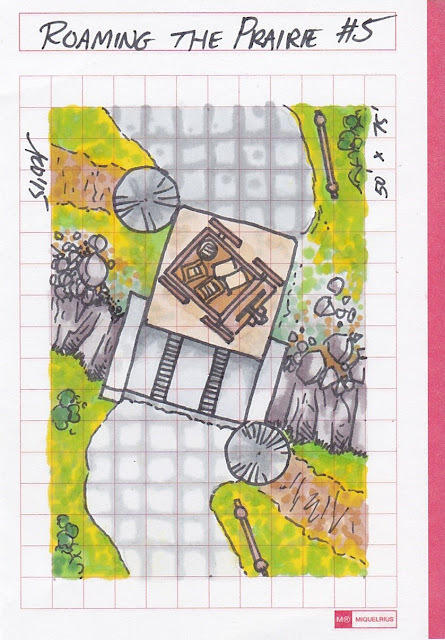 The Dwarves resupplied and over time engineered the Great Lift, which could carry 3-4 wagons at a time. The original lift, still in operation to this day, was nicknamed the Little Lift. Small caravans or groups of horsemen use it while larger groups are lifted nearby. The Little Lift is a 20 foot by 20 foot platform, raised by winches (wound by oxen or groups of slaves) assisted by counter-weights. The mechanisms can be run from bottom or top, contained within circular huts with metal roofs. At the top the ramp can be locked in place for loading and unloading. Centuries ago the Lion Road began in southwest Nuria Natal and followed the trail of many intrepid adventurers and explorers who made their way to the unknown center of the Southlands. Experience determined their path, such as skirting the dangerous jungles of Kush. After passing through the MBazha mountains avoiding ambush and avalanche, by way of mountain pass and narrow valley, the plains of the Narumbeki were discovered. The surviving Nurians met the warriors of the Narumbeki and discovered a like-minded folk, at least as far as commerce was concerned. At first, contact between the two nations was irregular, for small groups fell prey to the hazards of the journey; becoming lost, being attacked or simply vanishing completely. The merchants of Nuria Natal chose to committed themselves to this enterprise and organized heavily armed and well led caravans. Regular trade began soon afterwards, necessitating the establishment of trading posts and caravansaries along the path which when widened and flattened became a road. The Narumbeki gap runs through the eastern half of the MBazha mountains, north of Narumbeki and south of the desert, northwest of the Yawchaka Jungle of Kush. The Lion Road runs through narrow mountain valleys, after ascending or descending the foothills at each end. The route runs from the nation of Narumbeki in the south, starting in Akanda Chegutu to the nation of Nuria Natal in the north, its first stop being the oasis at Qitta, east of the Fassili mountains. The Lion Road is well-traveled, but as history has shown, dangerous. Heavily guarded caravans move from camp to camp, relying on fortresses, such as North Watch, to give their soldiers a break from endless nights of patrols and watches. The valleys of the Gap are subject to incursions by both the spawn of the Green Walker and lesser beasts of the mountains themselves. When the seasons turn cold, snow and ice, in the form of avalanche and storm, threaten those that remain on the Road. The flat stretches north of the gap feature more mundane hazards such as bandits and windstorms, the latter enhanced during the heat of summer. I plan to present Narumbeki Gap in a series of seven articles, including this one, the introduction. The next five will cover the five regions of the Gap, as described and shown above. 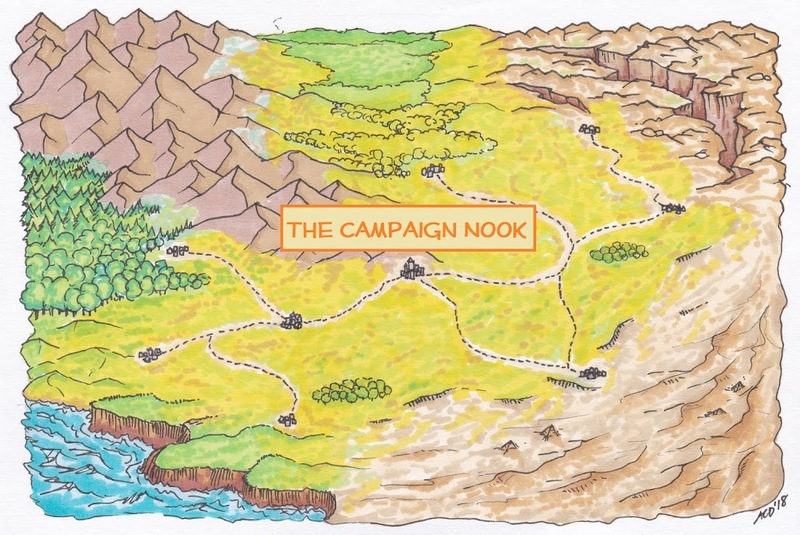 The first of those will be the lands astride and locations along the Lion Road. The last post will wrap up this endeavor including final thoughts and responses to any comments and questions received. T’Balla, tall but greying, smiles with arms spread wide, “But my apologies tired travelers. I am sure you would rather see your rooms and test the softness of our beds. But then you must join us for dinner, for every day at the Wondrous Vista is a feast and ends in a banquet.” He leads you into the Inn where his family and staff stand waiting. 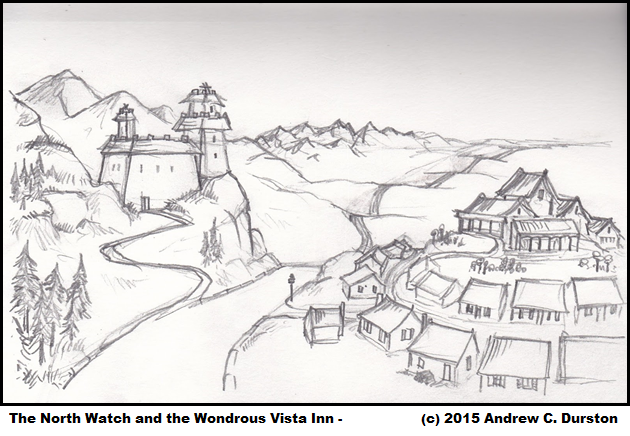 In the #Southlands north of the MBazha mountains and east of the Lion Road, a druid has grown a home in the foothills were the peaks descend toward the plains and wastes that lead north to Nuria Natal. 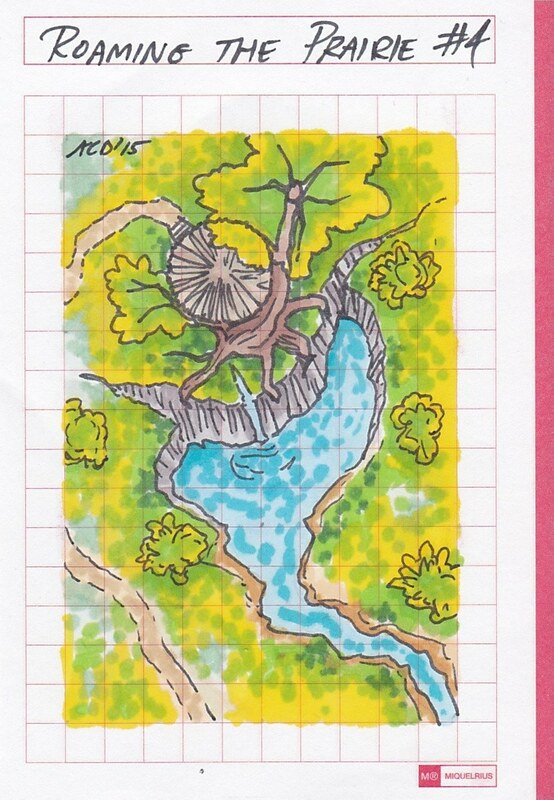 Simply known as the Weatherman, the druid's home nestles against a large tree that grows about the circular structure. The tree sits on a earthen outcropping. A spring flows from between its roots into a small pool leading to a creek flowing further downhill. The life-giving water supports both local wildlife and a small number of settlements nestled between the lower elevations of the MBazha range. No government holds sway here, disputes are settled by traditional means. If those fail, the Weatherman fairly and dispassionately adjudicates. The druid vigorously protects the area, usually by using wind, snow and rain to confuse, drench or bury unwanted intruders. The locals note the druid is especially harsh to any thing or persons coming from the southeast (the direction of Kush).